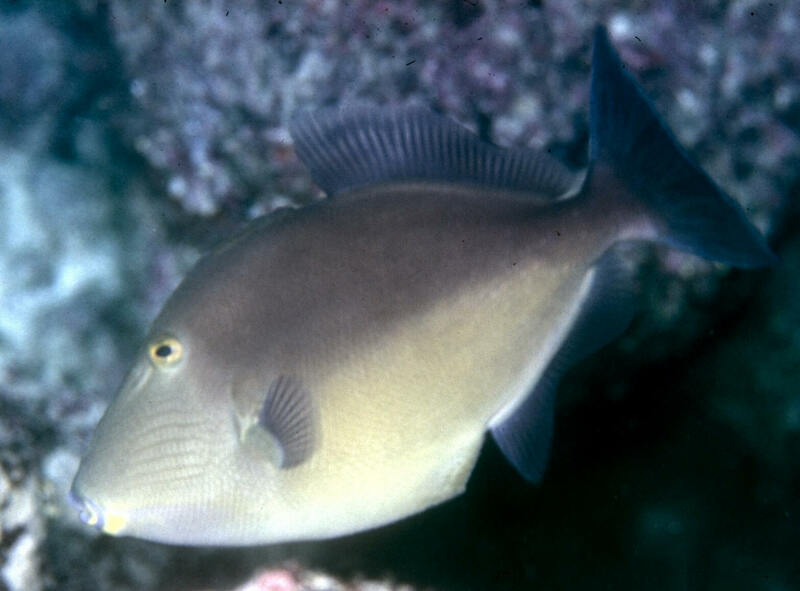 Sufflamen fraenatus (Latreille 1804), the Masked Triggerfish. Indo-Pacific east African coast, out to Hawai'iTo fifteen inches in length. Females are brown to yellow-gray, having a bright yellow bar on the lower lip; males have a long yellow stripe from the upper lip to the pectoral fin. A female here in Kona, HI. 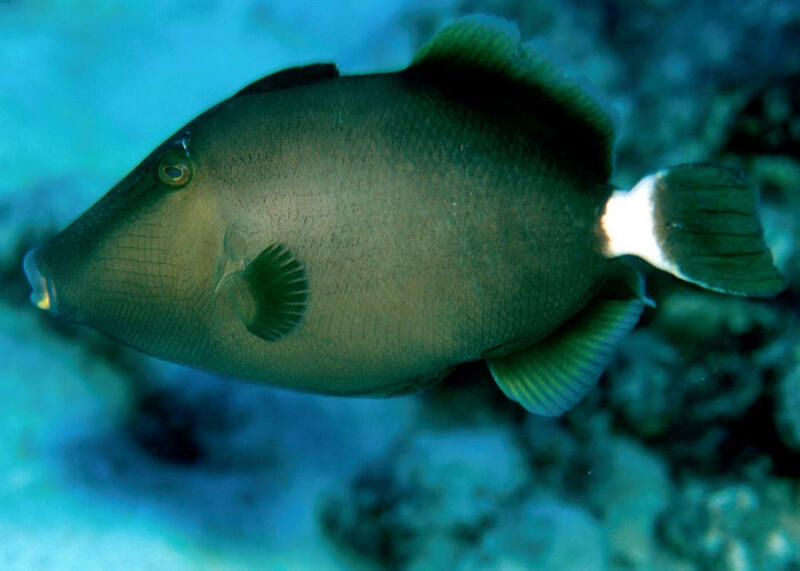 Sufflamen fraenatus (Latreille 1804), the Masked Triggerfish. Indo-Pacific east African coast, out to Hawai'iTo fifteen inches in length. 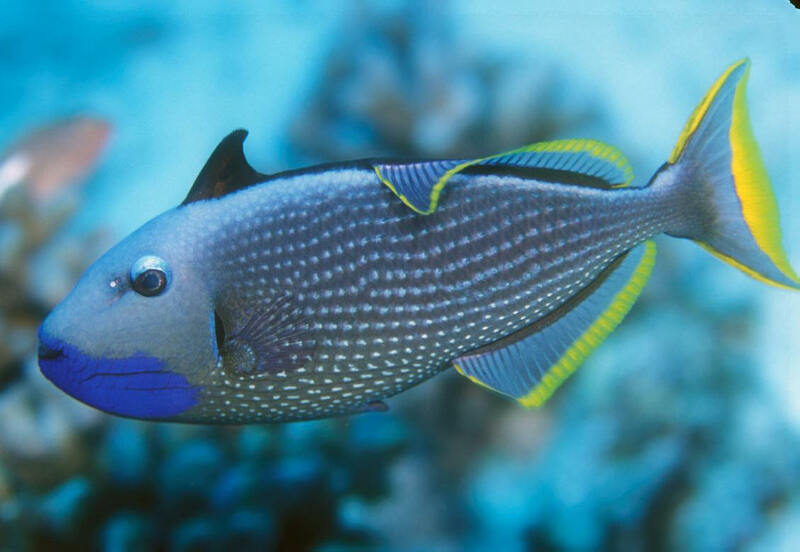 Females are brown to yellow-gray, having a bright yellow bar on the lower lip; males have a long yellow stripe from the upper lip to the pectoral fin. A juvenile in Mauritius 2017. The Orangeside Trigger, Suffflamen verres (Gilbert & Starks 1904). Tropical eastern Pacific, Mexico's Baja to Ecuador and the Galapagos. To sixteen inches in length. A female in the Galapagos. 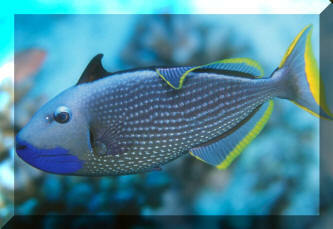 The Blue Throat or Gilded Triggerfish, Xanthichthys auromarginatus (Bennett 1832), true reef dwellers. Here is a male off of Maui, Hawai'i. Indo-west Pacific. To about a foot total length.